After an absence from commodity price prediction for 3 to 4 years, I decided to review my work. It really is amazing how close I managed to predict the price trends of several commodities. The approach I am using is to predict the shape of the trend and adjust to make the predicted prices more realistic. My work is truly unique and I know many have tried to copy my work but at this time, to my knowledge, no one seems to be able replicate my predictions. You know, when I began publication of my charts and tried to sell my book on predicting trends, the internet was flooded with articles that mentioned that stock markets could not be predicted. A few years later, this was followed by the idea of business cycles and yet I never found anyone who managed to even come close to predicting anything. Then I found that many authors are now claiming that the Jewish Shemitah was the reason behind the cyclical events. This is a very powerful reason but the final decision is with the Lord God and not with us. Now they are claiming that it is China's economy that is slowing down. Did you notice that back in 2009 to 2012 my charts predicted the current events and I had not updated or 'corrected' my charts since then. The prediction charts below show the actual trend, blue line, and the predicted trend, red/maroon/brown line. Did you notice that I got the turning points, when it turns up and when it turns down, on the trend line almost spot on? The data used is based upon one closing price data per month. 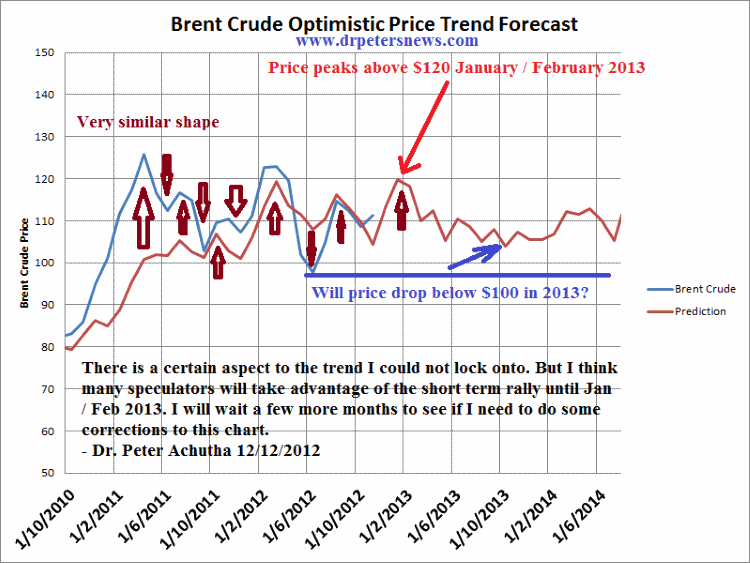 On 12th December 2012, when the Brent Crude prices was $110, I had published my prediction that Brent Crude price would peak in 2013 and then drop by 2014. Please check the 5 year chart at tradingeconomics.com on brent crude oil which shows that Brent Crude actually hit $118 in February 2013. I got that right! I was expecting it to drop down to $73 but it dropped further. When I published my charts in December 2012, no one was expecting the price to drop, in fact most people thought my predictions were wrong and Brent Crude prices would hold at around $110 forever. Amazing. May be I should have done a little more analysis to show how the price would behave into 2015 or 2016. 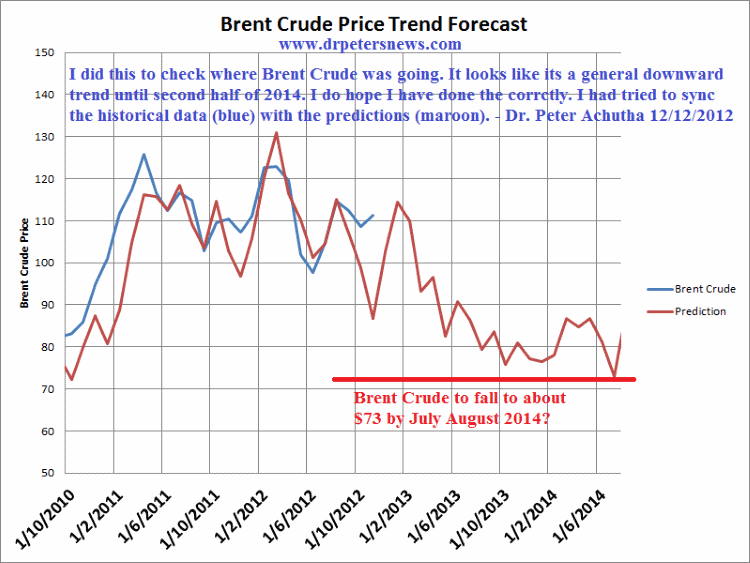 I was predicting Brent Crude price trends one and a half years into the future. Did I make history? 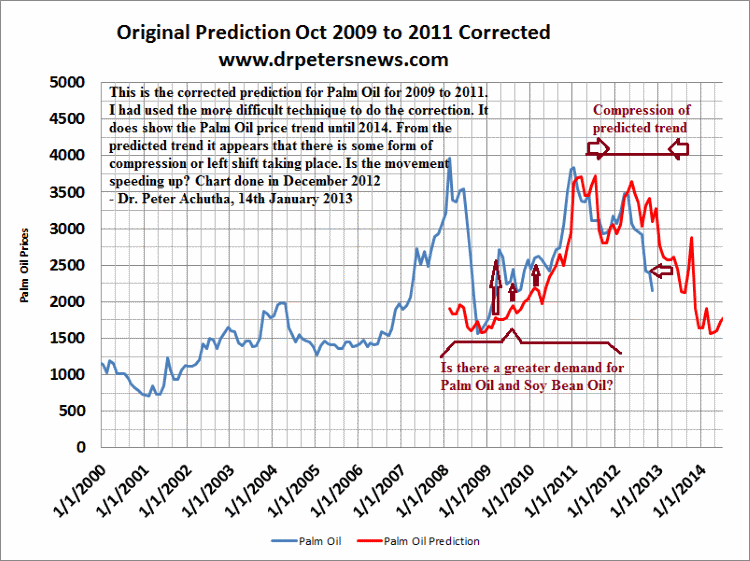 You can compare this prediction with the current palm oi prices as shown in indexmundi.com on palm oil My chart was don in Malaysian Ringgit where as the current data by indexmundi is in US$. The Malaysian Ringgit has fluated during this period from RM3.30 to RM4.4 to the US$. The blue line is the actual trend and the red line is the predicted trend. 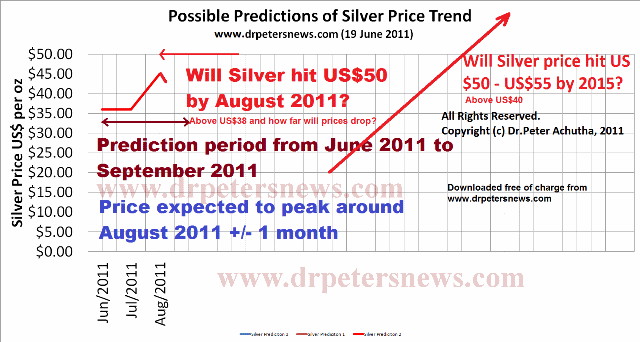 I predicted, on 19th June 2011, that the price of silver would spike between June 2011 and September 2011. Those who believed my prediction could have made a lot of money. Of course some fund managers got it into their head that their duty was to spend millions to ensure the spike did to occur so the top of the spike was flattened. As you can see from macrotrends.net on historical silver prices 100 year chart and select the 5 year chart option you will see that the actual silver price peaked in August 2011. The price peaked around $42. My timing was remarkable. It is truly an amazing price prediction as I had tried to predict the rapeseed price trend up to 3 years ahead. 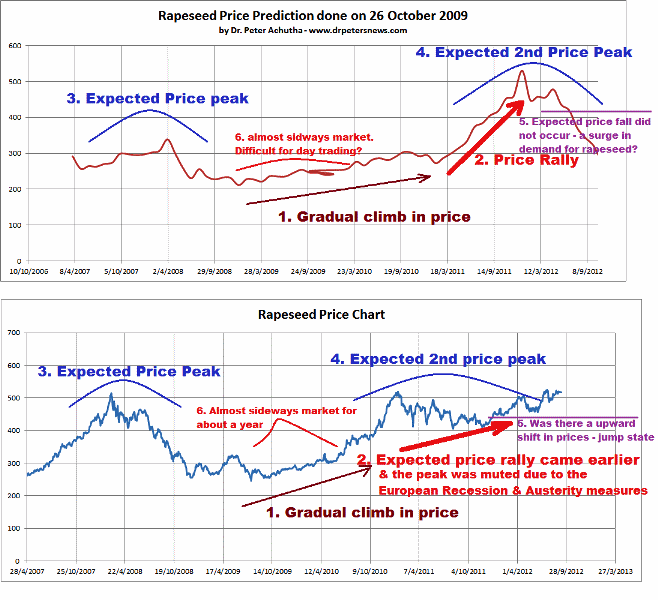 I did the price prediction chart in October 2009, the top chart and came back in 2012 to show the actual price trend which is the lower chart. That is why there are two charts on this image. Between 2009 and 2010 I was expecting a sideways market - not worth trading in. I expected the rapeseed price to rally after that. The rally came a little earlier than expected. What is amazing is that the prediction trend shows that rapeseed price falls in 2012. That is almost 2 to 3 years ahead I was predicting that the rapeseed prices fall. The price has been falling since 2012 until end of 2014! Please see indexmundi.com pn rapeseed oil for the actual historical price trend. I must admit that I may have done this soybean price prediction erroneously and I did not go back to update the prediction. There can be several reasons for this error but I still show this prediction to show you the truth - that it is possible to make errors when generating the prediction trend charts. The actual price trend is shown in nasdaq.com on soybean. For the trained eye there are a lot of similarities but I mistook the overall trend so my prediction does not look similar. 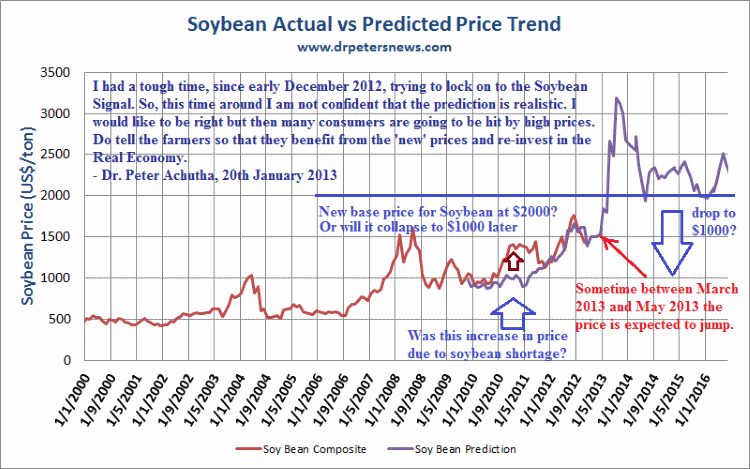 I did predict that the soybean price would peak in 2013 which it did, so that part was correct. So in conclusion most of my predictions are quite accurate.